While we just can't get enough of The Black Dagger Brotherhood, The Warden is going to make us wait. Judging by the way Lover Avenged left off, it will be so worth it. Lover Mine, the 8th book in the series, will be released in April 2010. This will be the much anticipated story of John Matthew and Xhex. It is also suppose to give us some back story of a young Wrath. Rumor has it that Blay will get his freak on. I've been visiting the Yahoo Group and The Message Board for tidbits. As soon as more details unfold I'll let you know. 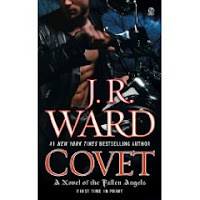 The Warden has promised us a sneak peak in her new book, Covet, due out in October 2009. I will not be preordering it and paying shipping nor will I be waiting beside my mailbox to get my hands on it either. I will need it ASAP as soon as it hits the shelves. You will find me posted up at either Barnes and Noble or Books-A-Million.